A year ago I purchased a few pieces of French Provincial furniture to go into my little girl's room but before I could get started on those pieces I became sick. After 9 months I am finally feeling myself again and I am very happy to be doing what I love to do - being creative. So let me show you what I have been working on the last couple of weeks. 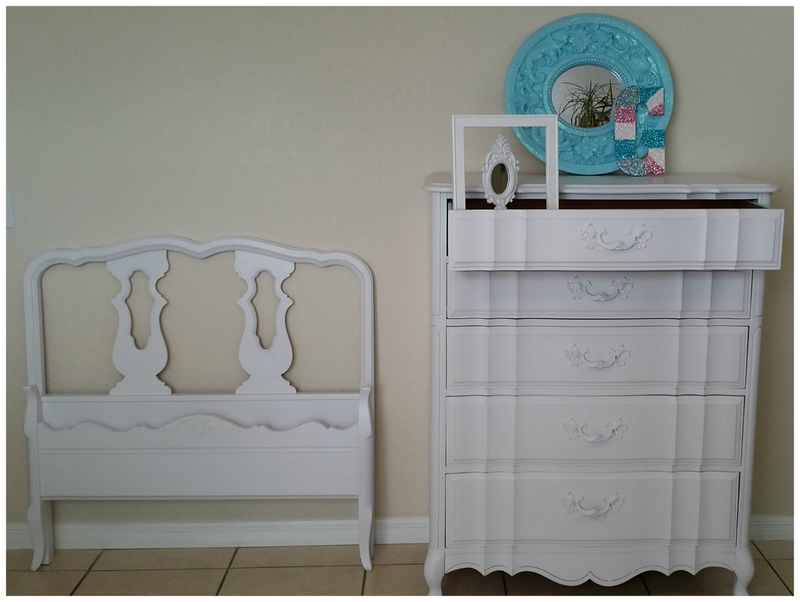 Here is the dresser and headboard now. I made my own chalk paint. I used a product called Websters Paint Chalk power and the paint color is called Dove White by Glidden, however when I had the paint sample pod made I had them make it with the Behr's brand. The top I sealed with water base poly coat in a satin finish, but the drawers and the sides I used ASCP clear wax. Here is a close-up of the drawers and the other pieces. I painted the sides of the drawers and the vintage mirror in True Turquoise by Glidden Paint and I lined the drawer with this cute bubble gum wrapping paper I found at Marshalls. My sweet girl love glitter so I gave her this glitterly "G" for her room and she loves it. I am catching up with all my DIY projects I have to do before the Holidays and let me tell you the list is long. Thank goodness I am feeling better, Woo Hoo! I appreciate you stopping by and can't wait to share with you my next project. 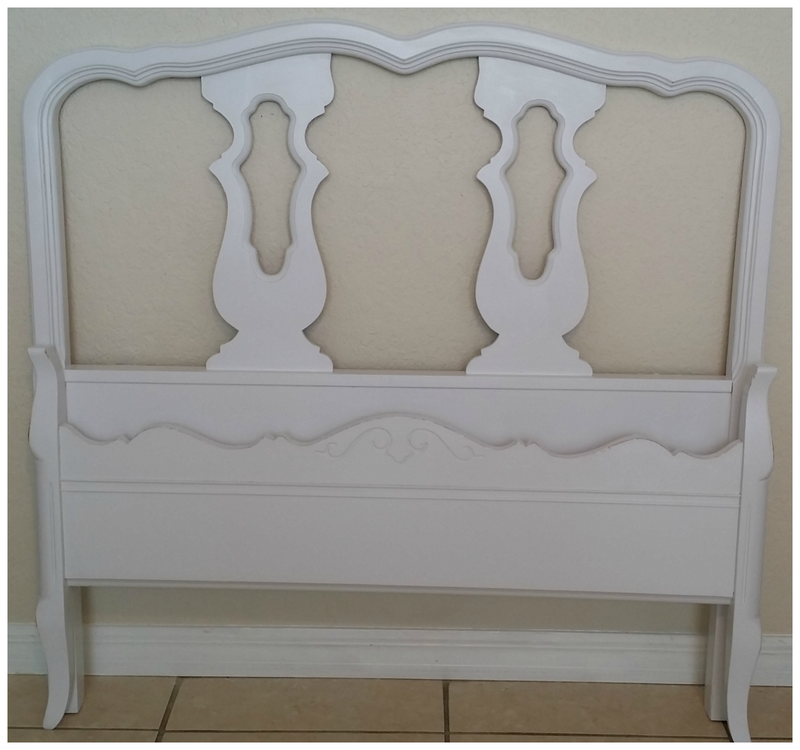 I am not of fan of headboards or chairs, but when I can finish them it's great. Thanks for stopping by. 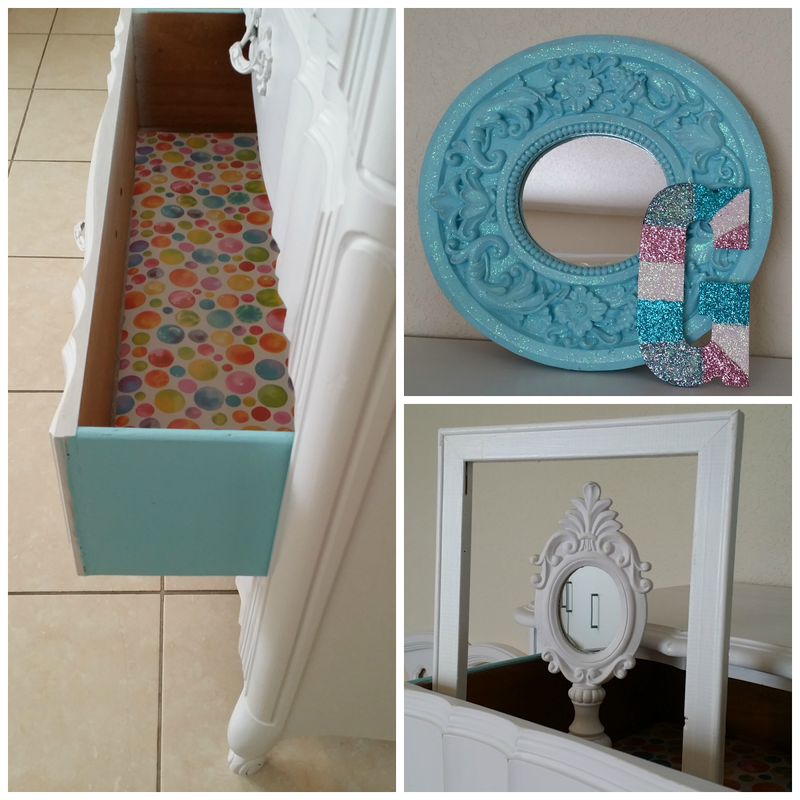 Love the colors you chose....and those drawer liners are adorable! Thank you so much. Appreciate you stopping. I love these pieces and can't wait to see the room - it's going to be beautiful with that turqoise. Vanessa! I love the way it turned out and the details and assesories really pull it all together. Your daughter is a lucky girl! I love white. I bought a bed for $20 this weekend that I will probably go white with. I love them! Tried a dresser makeover myself recently and I'm not at all happy with the result. Can't wait to give it another go! Aww, thank you Wendi. I loved that you stopped by. Have a great week. So pretty! You did such a great job. I'm in love! 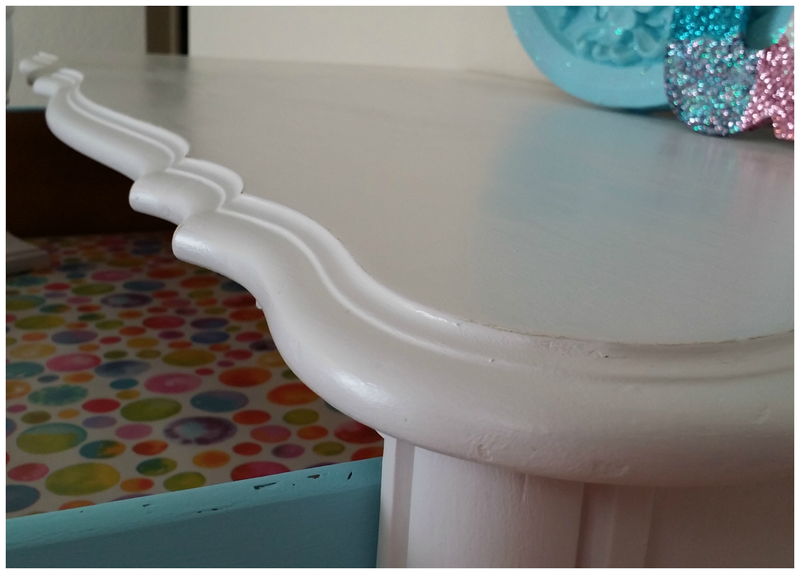 Did you use your own recipe to make the chalk paint or did you use one that you found online? That white is so, so pretty and I love the blue mirror, too. Thank you so much for stopping by appreciate your sweet comments. 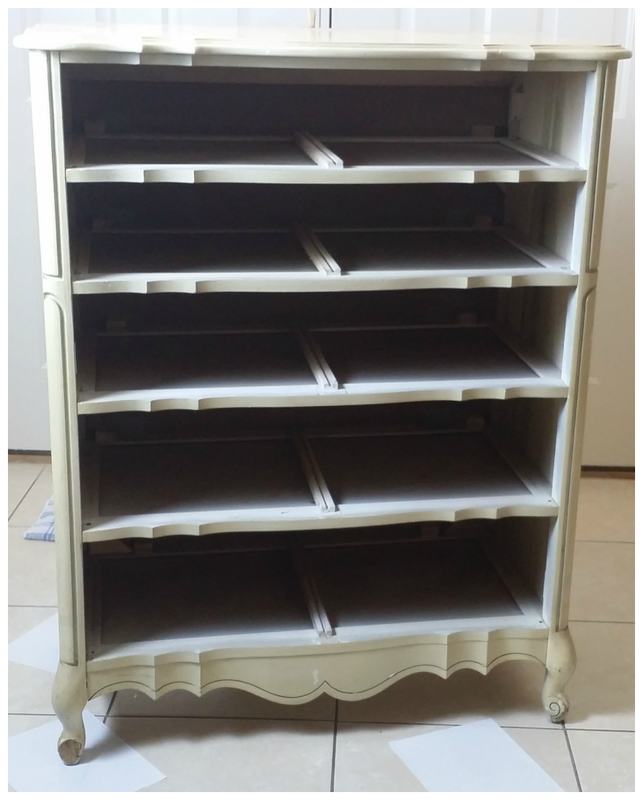 I did make my own chalk paint, but I used a producted called Webster chalk power and I added it to my sample paint pod. I only need 2 teaspoons and 1 teaspoons of water. I love this product better then the Plaster of Paris to be honest. It works best for me. Also when my piece is dry I use a med grit sand block and when I am done with that I take a 1000 grit sand paper and go over the entire piece. The 1000 makes the piece silky smooth. When you add your wax to the furniture the wax just absorbs into the piece. You won't have to buff much. The name of the white paint is Dove White by Glidden, but I had them make the sample pod in the Behr's brand. Hope this helps. Thanks again for stopping by. I love the lines to these pieces - they look wonderful - the added touches you gave for your daughter make them special! I am so delighted you stopped by that I might return the call! Love the drawer detail! It all looks so nice and fresh and clean. Happy Friday!